Sliding Doors can be incorporated into your building design, more popular in agricultural buildings as shown in the image on the left. 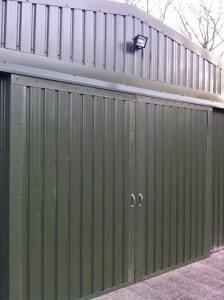 Our sliding doors are designed to your dimensions and constructed onsite by our steel erectors. Incorporating sliding doors eliminates the need for a separate personnel door whilst creating a large opening that can be easily and efficiently reduced to a narrower opening, this idea is essential for equestrian buildings. Our Sliding doors can be incorporated into a hanger design where a number of doors can create a wide opening whilst ensuring a efficient method of operation. Operation and locking mechanisms can be selected for your specific requirements.